He went on to suggest much more, of course, including a typical LRH appeal for general tolerance and the preservation of individual liberty. Yet given, as we have said, that he was not to serve with those occupational forces and given, too, the intensification of Dianetics research, it was not actually until 1951 that he once more specifically addressed himself to the theory of ethics. His vehicle was Science of Survival. 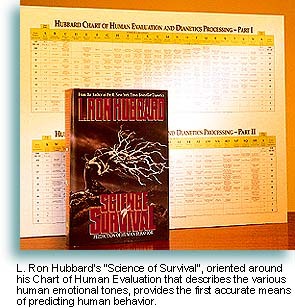 Oriented around his Chart of Human Evaluation that describes the various human emotional tones, the work offered the first accurate means of predicting human behavior. It also offered detailed explanation of the various dynamics of human existence, which is to say the various fields or entities one must cooperate with for optimum survival. Thus we find survival is accomplished along several routes, including survival as self, as family, as a group, as mankind and as part of all living things. And from that view of life as interdependent upon all else, came the first workable definition of "ethics": "Rationality toward the highest level of survival for the individual, the future race, the group and mankind, and the other dynamics taken collectively." Lest the point be missed, however, the key concept here was workability. As Ron has very correctly pointed out, ethics has traditionally been a contemplative matter with more or less endless debate on what precisely constitutes right and wrong. Then, too, the subject has been hopelessly confused with justice, which is yet another matter entirely, i.e., justice is the action taken on an individual by the group when that individual fails to conduct himself in an ethical manner. Thus ethics becomes a personal matter, and consists of those actions one takes upon himself for optimum survival across the whole of his dynamics. By extension then, good may be defined as constructive survival action, while evil is precisely the opposite. In other words, and this again from LRH, "Things are good which complement the survival of the individual, his family, children, group, mankind, life and matter, energy, space and time [the physical universe]." While evil is "anything which is destructive more than it is constructive along any of the various dynamics." The net result is, of course, ethics, not as a subject for contemplation  a matter of relative abstracts, as the psychologist would say  but a functional tool for real life. What is the argument for honesty and decency? Why is theft always, ultimately, unprofitable and murder even less so? Why is the despoiling of an environment so reprehensible, not to mention the ruination of a planet? Because when one carries the ethical equation out to the last critical digit, our optimum survival as individuals is absolutely interdependent upon all else, and only by constantly considering the survival of the many can we ensure our own survival. Then again, as Ron reminds us, there is also this: Because man is basically good, "when he finds himself committing too many evils, then, causatively, unconsciously or unwittingly, man puts ethics in on himself by destroying himself." By way of example, he points to the criminal who habitually leaves clues for his own undoing or the tyrannical dictator who drives himself mad. But factually, he adds, the phenomena is universal, and the cases innumerable. Having harmed too many, too often, and failing any real means to right their wrongs, men will directly and deliberately bring themselves to ruin. It was from this vantage point, then, this grand view of ethics as reason itself, that we come to the crowning LRH achievement: The actual ethics technology by which survival can be bettered. 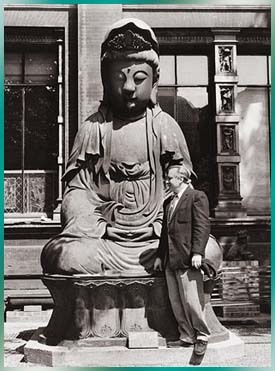 An historical precedent  but bearing in mind that what Ron now brought to the subject is wholly new  he refers us to the ancient Buddhist text, Vinaya Pitaka and in particular, Cullavagga, or the rules of conduct for the purity of monastic life under Buddha. According to tradition, it was the Buddha himself who authored the Cullavagga when the ethical lapse of disciples had been brought to his notice. Included are provisions for all major offenses as well as the more common breaches of monastic etiquette. But what distinguishes the document, and why it is relevant here, is that it constitutes one of the first (and very rare) attempts to develop an ethical system, not for punishment, but for rehabilitation. Thus, in addition to delineating the infringements, the Vinaya Pitaka also prescribes the method of atonement. In one sense, the LRH ethics technology provides the same: To those who have been ostracized from a group owing to unethical conduct, Ron very definitely provides the route back home. But he also provides much, much more. In fact, with the LRH ethics technology comes not a means for ethical salvation through atonement, but true rehabilitation through an understanding and application of what amounts to the fundamental laws of this universe.